Without a clear understanding of the human side of virtual reality (VR), the experience will always fail. The VR Book: Human-Centered Design for Virtual Reality bridges this gap. Design for virtual reality is an incredibly complex challenge. When done well, these experiences can be brilliant and pleasurable, but when done badly, they can result in frustration and sickness. Whereas limitations of technology can cause bad VR execution, problems are oftentimes caused by a lack of understanding human perception, interaction, design principles, and real users. This book focuses on the human elements of VR, such as how users perceive and intuitively interact with various forms of reality, causes of VR sickness, creating useful and pleasing content, and how to design and iterate upon effective VR applications. The industry is rapidly evolving, and The VR Book stresses the importance of building prototypes, gathering feedback, and using adjustable processes to efficiently iterate towards success. With extensive details on the most important aspects of VR, more than 600 applicable guidelines, and over 300 additional references, The VR Book: Human-Centered Design for Virtual Reality will bring a strong foundation for anyone and everyone involved in creating VR experiences. The basics are covered for those new to VR before digging into deeper detail. Learn the differences between immersion and presence, and how to create both for fully engaging experiences. Learn how to fully bring users into your creations that goes far beyond simply being a disembodied viewpoint in space. Select the most appropriate hardware and interaction patterns/techniques that best fits your project goals. Learn how to efficiently collect data from users in order to create the most compelling experiences. The book concludes with a brief plan of action that anyone can follow to start creating worlds even if only part time. The VR Book is broken down into seven parts, with each part containing multiple chapters. Part I explains what VR is and why it is so different from other mediums. A history is provided and different forms of reality are described ranging from the real world to fully immersive VR with a description of various hardware that composes those realities. Immersion, presence, and fidelity continua are also discussed. By understanding the human brain and how we perceive real and virtual worlds, we can create better VR experiences in more innovative ways. Six chapters provide real-world examples that prove reality is not always what we think it is, explanations of perceptual models and processes, the physiology of the different sensory modalities, theories of how we perceive space and time, and a discussion of how perception relates to action. There are numerous health-related challenges of VR. Most notably is motion sickness, which is the greatest risk for VR. Five motion sickness theories are reviewed along with a new unified model and examples of how to mitigate sickness. 49 factors that contribute to VR discomfort are divided into system factors, individual user factors, and application design factors. Interesting worlds do not happen by accident. Five chapters cover the essential elements of a VR experience such as the structure of the world, the story, the action and reaction, the characters and social community, the music and art. Integrating these different pieces together, along with some creativity, can result in experiences that are more than the sum of the individual pieces. Interacting within scenes makes VR something more than just a passive experience. Five chapters cover core interaction concepts, input device characteristics and classes, and 16 Interaction patterns divided into Selection Patterns, Manipulation Patterns, Viewpoint Control Patterns, Indirect Control Patterns, and Compound Patterns. 57 more specific exemplar interaction techniques are also described. Like the real world and the humans that inhabit it, there is much that is unknown about VR. Iteration is essential for creating engaging experiences and the team should focus on quickly discovering what works for users in order to iterate towards success as efficiently as possible. Five chapters cover the philosophy of VR design along with the Define-Make-Learn Cycle. Previous parts of the book are only the starting point. The field of VR and its many applications is completely wide open—we are in no danger of running out of new possibilities. And hopefully we never run out of those possibilities. It is up to the reader to use VR technology in whatever way she wishes in order to help shape the future of the world. "The definitive guide for creating VR user interactions." "Dr. Jerald has recognized a great need in our community and filled it. 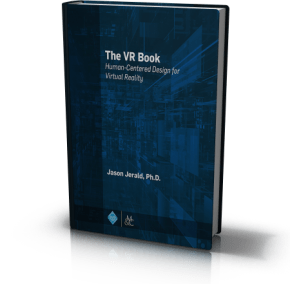 The VR Book is a scholarly and comprehensive treatment of the user interface dynamics surrounding the development and application of virtual reality. I have made it a required reading for my students and research colleagues. Well done!" "Conceptually comprehensive, yet at the same time practical and grounded in real-world experience." "The summative guidelines provide quick access with back references for further understanding." Jason Jerald, Ph.D., is Co-Founder and Principal Consultant at NextGen Interactions which focuses on VR consulting and contracting services. In addition to primarily focusing on NextGen Interactions and its clients, Jason is Chief Scientist at Digital ArtForms, is Visiting/Adjunct Professor at the Waterford Institute of Technology, serves on multiple advisory boards of companies focusing on VR technologies, co-coordinates the RTP-VR Enthusiasts Meetup, and speaks about VR at various events throughout the world. Jason has also served on the ACM SIGGRAPH, IEEE Virtual Reality, and IEEE 3D User Interface Committees. Jason has been creating VR systems and applications for approximately 20 years. He has been involved in over 60 VR-related projects across more than 30 organizations including Valve, Oculus, Virtuix, Sixense, NASA, General Motors, Raytheon, Lockheed Martin, three U.S. national laboratories, and five universities. Jason holds a BS in Computer Science with an emphasis in Computer Graphics and Minors in Mathematics and Electrical Engineering from Washington State University. He earned a Master and a Doctorate degree in Computer Science from UNC-Chapel Hill with a focus on perception of motion and latency in VR. Jason holds over 20 publications and patents directly related to VR. The VR Book is now shipping! Order from Amazon or directly from the publisher at one of the links below. You can also follow us on twitter at https://twitter.com/TheVRBook. Fast access to references, cross references, index terms, and guideline details with a simple click. Search through the document with standard search functionality. Read anywhere without the additional weight of carrying a book. For those that still lean towards physical reality. The best of the real and the virtual. Read anywhere rather you have forgot to bring the book or if find yourself lacking digital access. 20% discount over buying separately.